Color: Pink Take your tablet to the next level - the Travel Tablet Pillow does double-dutyas a comfy way to balance your tablet, and an easy way to store tabletaccessories. A front pocket holds almost any size tablet or e-Reader securelyin place, at the perfect angle for reading the news, watching a movie, orsurfing the Internet. Made from super-soft fleece, the Travel Tablet Pillowgently cradles your tablet, so you can relax instead of having to hold yourdevice. The snap-on handle easily attaches to a suitcase or backpack forportability. With the Travel Tablet Pillow, you can keep everything fromheadphones to chargers stored in the handy mesh pocket. 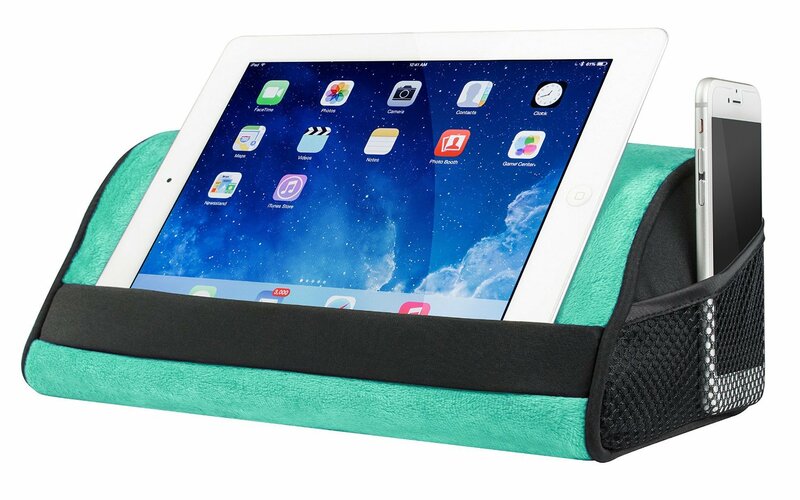 Available in a varietyof colors, the Travel Tablet Pillow is the perfect accessory for the tabletuser - it works overtime to keep you organized so you don't have to.